This is very adorable. I got a great email leading me to the photo above. “Iâ€™m the organizer for my neighborhoodâ€™s book club. 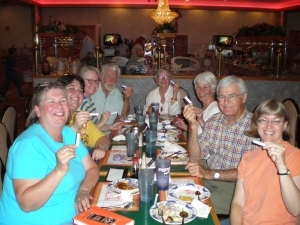 We read your book last month and then ate at King Buffet, which is one of the fortune cookie winning restaurants here in Lawrence, Kansas.” The photo is of them holding up their fortune cookies fortunes! Lawrence is one of some 19 Chinese restaurants I visited in my investigation of the great Powerball mystery of 2005.